The Ministry of Defense's Material and Purchasing Board annually performs an Industrial Day, including representatives from the Danish defense industry and educational institutions. The purpose of the Industrial Day is to create a framework in which managers and employees from the FMI and the other authorities of the Armed Forces can meet with representatives from the Danish defense industry, which they can discuss opportunities, needs and issues with. Industrial Day is a natural initiative in connection with the Ministry of Defense's " Open for Business " strategy, which contributes to the promotion of Danish companies - primarily in relation to defense and aerospace. InterForce is a cooperation between the defense and the private and public sector about the use of the defense by the reserve and the Home Guard's volunteers, collectively referred to as the Reserve Force, so that the total resources of society are utilized as best as possible. InterForce's purpose is to improve the conditions for employees who have both military and civilian obligations. Starekass meetings have been successful in Copenhagen for several years. A key element of these events is the opportunity for debate and networking. Participants were therefore divided into 10 groups discussing digitization, culture and personal leadership, after which there was an hour's debate in plenary where everyone invited in and where views and inspiration could be shared in a closed, confidential space. The event ended with a tapas buffet, after which Livgardens Musikkorps played the participants through the ARoS, which resulted in a moodful end to a successful day. 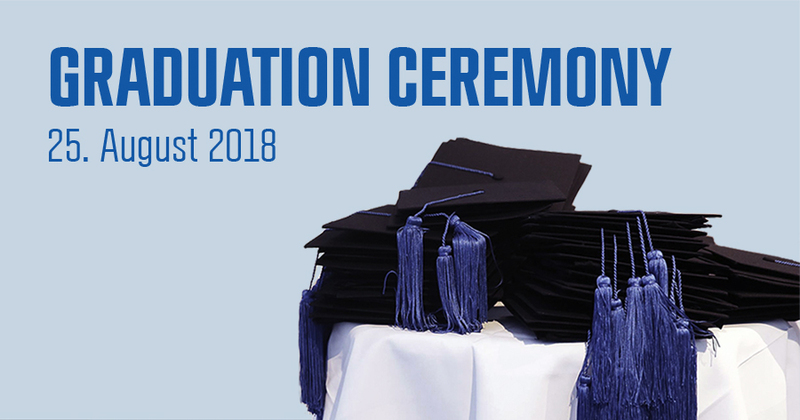 The ceremony is for all graduate students who have submitted their master’s thesis between May 16 2017 and August 1 2018. At this day of celebration, graduates are allowed to bring guests, which can be done by buying a ticket for them. Besides a glass of champagne and good food, there will be speeches, by His Royal Highness, Prince Joachim, and President of CBS, Per Holten-Andersen, among others. There will also be a parade for the graduates, and entertainment such as comedy and music to enjoy at the ceremony. of course no report, or photos - shameful! Joachim has been the patron of Copenhagen Goodwill Ambassadors since 2008, which aims to promote Copenhagen internationally and attract foreign investors, businesses and tourists. The Corps was founded in 1996 by Copenhagen Capacity and Wonderful Copenhagen. Joachim holds lectures in the Schackenborg Foundation's lecture series "My South Jutland"
The sun shone with the guests in the Schackenborg knight hall when Prince Joachim was back in the castle on Wednesday evening to talk about the topic "My South Jutland". The generous speech was the last in a longer meeting series organized by the Schackenborg Foundation over the last two years prior to the celebration of the 100th anniversary of the Reunification in 1920. Former editor-in-chief of Der Nordschleswiger, Siegfried Matlok, had assumed the role of chairman. - "This is something new and special. It's actually the first time that the prince has said yes to making such a public meeting, and I would like to start by thanking the prince for his desire and courage to meet you here in his former home", he exlaimed. He emphasized that the word was free of the prince's presentation, and that all questions were welcome. "If you ask a worthy question, you get a worthwhile answer", said the chairman. Since Wednesday was Flag Day for Denmark's broadcast, it was replaced by the usual common song today. Instead of "For a Stranger Rough and Poor," Wednesday was sung "Always Good When You Go". A change in the program that came behind Prince Joachim. - "I must say before I went to bed, I practice the song "For a stranger tough and poor, because it is a tribute to western South Jutland - one might almost count it for a kind of national anthem on these edges", said the prince. Prince Joachim revealed that, even before he moved into Schackenborg in 1993, he had become aware that this song was worth knowing. 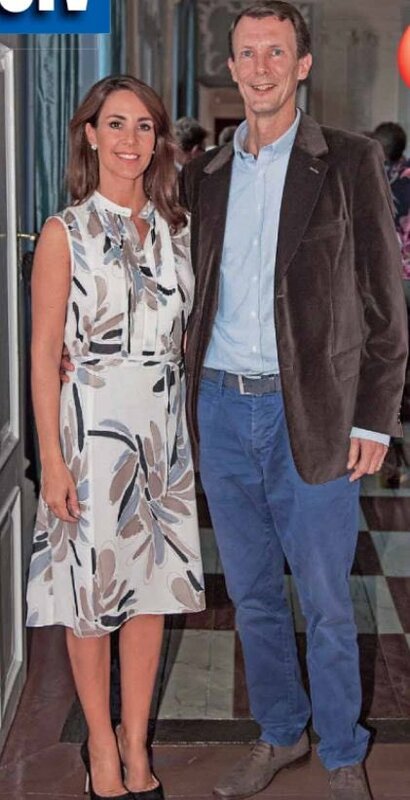 - "Now I can sing both in my sleep, from the front and from the back", Prince Joachim sounded great fun for the about 100 guests in the knights hall. Prince Joachim came across his post. He explained, inter alia, how he had learned how important it was to know the difference between southern Jutland on the east coast and west coast, as well as giving him the opportunity to share a couple of fun personal experiences living near the border. After the prince's presentation, the audience in the hall was given the opportunity to ask the prince questions. While most of the audience was just getting used to, Siegfried Matlok made sure that the prince was required to answer this and hint. Among other things, the disputed wild boar fence. Despite the fact that the prince was unable to embark on an overly political discussion, he still found an answer. - "I come from agriculture, and the scare scenario must be that we are again excluded from the lucrative markets we are dealing with. Just as it did in the eighties with foot and mouth disease. Viewed in this perspective is 70 km. fence may be a small price when we can show that we are still so vigilant in Danish agriculture, as we have always been", said Prince Joachim. Siegfried Matlok would then know if the prince was not nervous that it would not hurt the relationship across the border. - "A fence does not mean that you should remember to show your passport every time you cross the border. There is a daily life, and even though there is a formal limit, it has almost been wiped away by the people who live here in everyday life. That is what characterizes the area", Prince Joachim noted. I'm always impressed with Joachim's gravitas, though I've gotten the impression he is not well liked? Maybe it is something I have read here, I don't know why I have that in my head, but it came to me because I do like him myself. That said, he has more gravitas, and sense of duty in his little finger than Fred and Yrma together. His Royal Highness Prince Joachim visited the Sorø Rotary Club at Ankerhus on Tuesday evening. 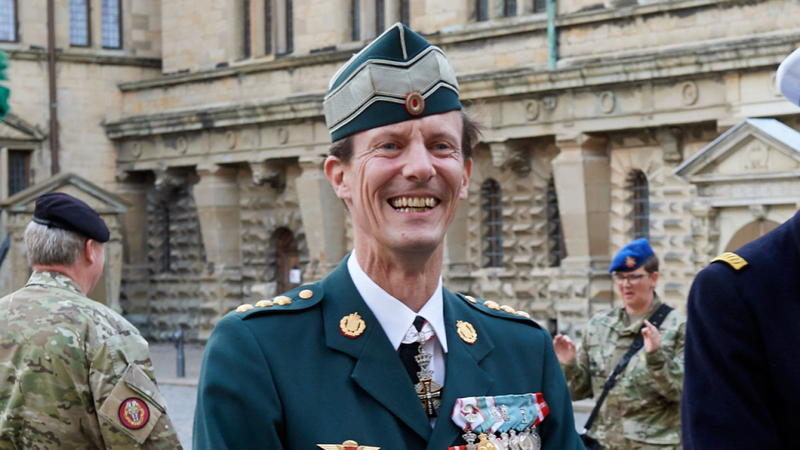 In 2015, Prince Joachim joined a new position as a Special Expert in the Armed Forces in relation to the implementation of a new full-force concept that will strengthen the use of volunteers in the Home Guard and personnel of the reserve in a fixed structure. The prince, who has the rank of Colonel, spoke at the meeting in Sorø Rotary Club on Tuesday evening. The meeting also included Rotaryaners from the neighboring club in Slagelse. - "It was a great chance to come", said Anne Plasmann, who, as President of the Sorø Club, in the previous period, addressed the royal house. - "Actually, I would have expected a rejection, but I would not let myself stop, and the prince said yes to attend. During the period I was president, we could not find a date that suits, so although Carsten Nøddeskou has now taken over the presidential post at Sorø Rotary Club, I was allowed to conduct my meeting for a new period". - "In my term as president, I have been looking forward to getting exciting business lecturers and people with an exciting life story to visit the club in Sorø", she continues. - "And along the way, I came to think that Prince Joachim also represents a profession. Most people know the history of Schackenborg, but there are probably not many who have knowledge of what the prince is doing today. At least I would like to hear a little more about that. Around 100 participated in the meeting, commencing with common habits, after which HKH Prince Joachim told about his work. The prince came to Sorø as a private person without the wide array of security personnel and helpers. Therefore, it was also a closed meeting, such as the press was not invited. Recently Joachim and Marie (she was not pictured in the official photos) returned to Schackenborg where Joachim gave a personal speech to a packed audience over the topic: My Southern Jutland. Joachim has often been praised for being a good speaker. Ken Richter wrote the article so this is what Joachim actually said! - "I Don't think I ran away". - "I had to lay down my arms". - "Schackenborg is a wonderful place, but the reality was that the manor was a business with a not insignificant debt which I took over. I did not manage to get that debt out of the way. We made several initiatives with savings, investments and new initiatives, but when that is not enough, you must draw a line in the sand at some point. A place like this doesn't run itself, but I have never let go of my feelings and my desire to be here". Over the centuries there have been ups and downs regarding Schackenborg, but once Joachim had to give up, it closed a chapter: - "There is no use in thinking about a past that has been decided. I will however not deny the reality behind it. It must as such not be a ghost in my life and nor for my children. We have chosen to remember the plus sides, even though there were minuses as well. The children must be spared knowing about the minuses at the age they are in"
- "It was in the summer of 1976 where I was on holiday at Gråsten Manor. The Crown Prince and I had been invited over one afternoon to experience and see Schackenborg. We were out harvesting and to a seven year old lad that was... wauw." When he was nine it was announced that Joachim should take over Schackenborg. - "From that period another reality entered my head. Now I had to identify myself with this place, and it's utterly unique. Not only when it is beautiful and in ful bloom, but also when there are no leaves on the trees and when the water is falling horizontal from the west." He came more and more often to Schackenborg. - "In that way there was more and more meat on story for me. It was now my home ground. It is a unique and terrific countryside and the oasis in all of it is Møgeltønder and Schackenborg. It is also a personal oasis, because it is a peaceful place, where there so many good vibrations each time we are here and the time always feels too short". - "We are grateful that we can come visiting regularly here at the manor. The children's Lego is still strewn here and there. That is also what makes this place such a human/habitable place". - "That was the decisive day when I took over running the business and the manor." - "I know the whole country pretty well and have lived in several corners of the country like Aalborg, Viborg, Oksbøl, Southern Zealand and Falster. But the identity I have felt down here is something completely to itself. One is invited inside in this little part of the world, upon which you discover how big it is on the inside. How spacious it is, how interesting and rewarding it is. It is all something I have felt and sensed - and still feel. That is also something - to be totally honest - I miss to this day." - "Time is going incredibly fast. But that you remember with joy, that no one can take away". Remind me again - is Marie about 15 years younger than Mary? Prince Joachim was the main speaker, to thank all those who help defend Denmark, on "Defense Day", held for the 42nd time at Kronborg in Helsingør. It is a day of celebrating and appreciating the defense-friendly associations and home security that help guard Denmark. As a colonel of the reserve, Prince Joachim attended the wreath laying ceremony in front of Kronborg's Secondary Lieutenant School. The fallen were marked with a wreath from the Home Guard, People & Security, and the Defense Day at the Memorial, before a parade indicated by the home guard Tambur Corps left to Kronborg's Knights Hall, where Prince Joachim took the chair. - "Whether it is the coaches of the local sports club or the local association's voluntary board. Just remember to say thank you and show appreciation - also to the soldiers, the defense or the home team who help defend Denmark", said Prince Joachim.